The Abhidhamma expounds a revolutionary system of philosophical psychology rooted in the twin Buddhist insights of selflessness and dependent origination. This system organizes the entire spectrum of human consciousness, mapping with remarkable rigor and precision the inner landscape of the mind to be crossed through the practical work of Buddhist Meditation. In this groundbreaking book, Venerable Nyanponika Thera penetrates the formidable face of the Abhidhamma and makes its principles thoroughly intelligible. Basing his approach on the detailed list of mental factors that the Abhidhamma uses as a guide to psychological analysis, he explores conditionality, the nature of consciousness, the temporality of experience, and the psychological underpinnings of spiritual transformation. Innovative and rich in insights, this book demonstrates the continuing relevance of Buddhist thought to our most astute contemporary efforts to understand the elusive yet intimate nature of the mind. In Abhidhamma Studies, the Ven. Nyanaponika Thera has done something truly unique. For many of those who have a cursory acquaintance with its contents, the Abhidhamma is an impenetrable thicket of terms and tables. It is seen either as the dense high philosophy of monks who succeeded the Buddha, or the loftiest teachings of the Buddha, meant for gods and enlightened monks. In this book, Nyanaponika Thera brings the Abhidhamma down to Earth and gives us just a glimpse of the insights it yet waits to unfold. In his introduction, Nyanaponika Thera argues that the Abhidhamma is only relevant as an organic, growing discipline engaging the minds of courageous and insightful souls. This work is not a dry summary of the contents of the seven books of the Abhidhamma, but an introduction to the method of the Abhidhamma. The book begins with a brief contextualization of the Abhidhamma. The Abhidhamma is the third "basket" of the Pali Canon, the canonical scriptures of Theravada Buddhism. It consists of seven books, and these seven books are largely composed of lists of terms, definitions, and classification schemata. The origin of these books, however, is a subject of dispute. 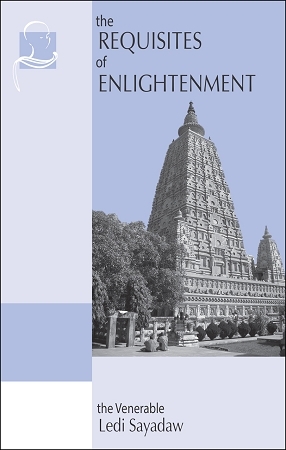 One of Nyanaponika Thera's primary aims in this book is to show the profundity of these books. The degree of rigor, consistency, depth, breadth, and purpose one finds in the Abhidhamma cannot help but suggest the presence of a sublime mind. As the author unpacks a small fragment of this teaching, one becomes mesmerized by the subtlety of this system. More importantly, the practical application of the system becomes readily apparent. The purpose of the Abhidhamma is not to systematize and classify all of reality as an intellectual curiosity. Its true aim is to systematize the reality experienced by the mind relative to the goal of liberation. Without this focal point, the system of Abhidhamma would be left chasing its own tail, attempting to prove its own suppositions. However, because liberation provides both the ground and the aim of this system, many of the questions which plague metaphysical systems become moot. For instance, the question "what is a phenomenon?" is replaced by the question, "what are the characteristics of phenomena?" In the view of liberation, it is very important to realize that phenomena are impermanent, impersonal, and unsatisfactory. Beyond this, it is not relevant to attempt to define phenomena in terms of something else. The Abhidhamma is a great boon for anyone attempting to understand causality at a deeper level. Nyanaponika Thera gives a beautiful exposition of the system's two-fold method of analysis and synthesis. Through analysis, the Abhidhamma dissolves the solidified reality of "I" and personality into a multitude of mental factors. Through synthesis, the Abhidhamma shows the relations which exist between these factors, and how they challenge or support one another. Nyanaponika Thera's insights will mirror the experience of all those who have taken some time to witness the mechanics of their own mind. More importantly, his writing offers a tool to refine our own observations. A critical insight offered by the author is that the way we observe can affect the course of what we are observing. For instance, we might find that our mind is see-sawing between agitation and tranquility. If we focus unwisely on the agitation, we may very well increase the agitation to the point where tranquility leaves the scene altogether. Similarly, if we focus wisely on the tranquility, the agitation may very well subside. The author offers many examples of how mental factors engage and balance one another, and for those who are devoted to maintaining continuous mindfulness, these observations are invaluable. 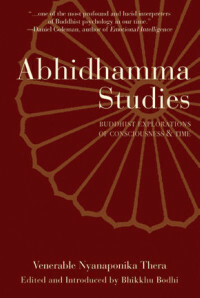 Abhidhamma Studies succeeds on multiple levels. As an introduction to the system and method of Abhidhamma, it reveals this branch of the Pali Canon to be a perennial philosophy, a body of thought which not only provides timeless philosophical, psychological, and ethical insights, but also opens myriad channels of exploration and exposition. As applied Abhidhamma, it demonstrates the power of both the system and the method, delivering practical insights for anyone engaged in serious meditation. Most importantly, this work demonstrates the value of a clear and focused mind directed toward understanding the subtlest mechanics of reality. It invites us to establish a continuous awareness of the causal mechanics of our mind, destabilizing the ego and paving the way to wisdom. For those with a philosophical inclination, this book is a nourishing gourmet meal. Enjoy!